I have been a fan of Tawdra's for ages now though it's been a long time since I've had the opportunity to read any of her work. So, when her newsletter came out and mentioned that this gem was available for free on Amazon, I didn't hesitate to have it sent to my ancient Kindle! I am so glad that I did. There is something just refreshingly real about her characters. Not to mention that having come from a small town myself, I've seen just the types of things mentioned in this book and it did make me long for the types of friendships that these characters have and are able to maintain. This book was an easy read, like all of Tawdra's books are. If you're looking for deep, dark material, keep on moving. This is one of those tales that is perfect for a chilly winter's day under the blanket...or in my case, sitting in the car waiting for a kid to get out of his sax lesson. Now, me being me, has to point out the flaws, tiny as they may be. A few times I noticed that some of the word orders were swapped. As someone who writes a lot, I know just how that happens. The brain gets too fast for the hands and then your proofreader's brain autocorrects it when they read it. It wasn't enough to pull me out of the story, but I did notice it. My only other complaint? I honestly have no idea which book in which series this is...The cover on my Kindle copy says Love in a Small Town - 4. 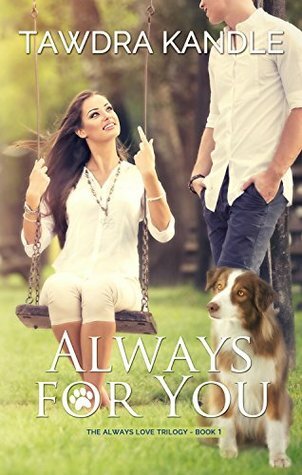 The cover on Goodreads and the text there says Always Love #1 and Amazon says Love in a Small Town book 5. Now, it's entirely possible that the book is part of two series but there's no way it can be both book 4 and 5 in the same series! Like I said, minor issues and none of them take away from the story itself.